#ROHadriana a ravishing feast for eyes and ears with killer roles & dramaturgy. If Cilea was a one hit wonder, he hit bullseye! Hugely enjoyed #ROHadriana tonight. Fabulous orchestral sound & great singing all round - delighted to hear @BrianJagde for the first time. @BrianJagde congrats with #ROHadriana ! You absolutely stole the show! One of the best tenors I've seen at the #opera house! 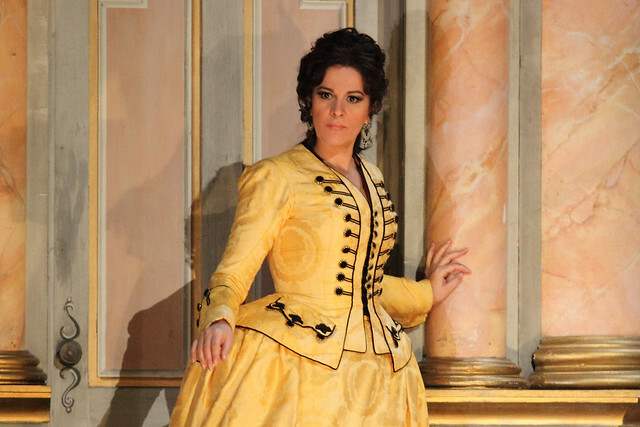 What did you think of Adriana Lecouvreur? 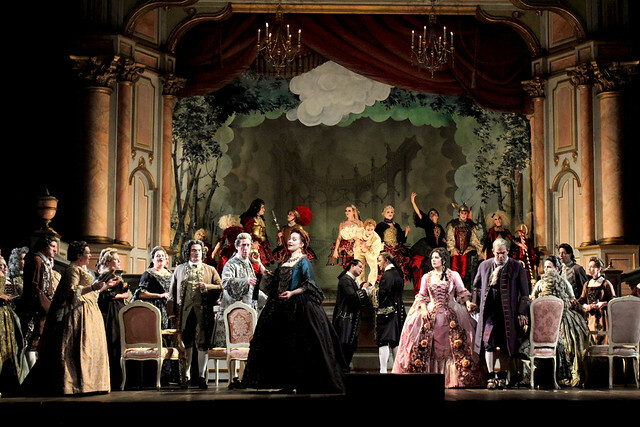 Adriana Lecouvreur runs until 2 March 2017. Tickets are still available. The production is a co-production with Gran Teatre del Liceu, Barcelona, Vienna State Opera, San Francisco Opera and Opéra National de Paris, and is given with generous philanthropic support from The Friends of Covent Garden. Always feel like fall in love when I hear Angela Gheorghiu's lovely and impressing voice! I was very glad to see the opera again. Despite the absurdities of the poisoned violets, it has some lovely music and this remains a stunning production with possibly the best sets I can remember. I thought Finley (beautiful sustained soft singing) and Dudnikova (new to me and I hope to see and hear more of her) were both better than their predecessors and although Jagde is no Jonas Kaufmann (who is?) he sang very impressively - and as for the diva it was difficult to believe she has been singing here for 25 years so fresh did her performance seem - and she is perfect in this part. Thank you. Always happy to see and listen to Angela Gheorghiu! Celebrating 25 years since her debut at the ROH and still no one can hold a candle to her!..The instantly recognizable timbre, her pure and powerful voice and stage presence and also an instinct for great musical choices make her probably the best soprano around. Brian Jagde is a young and very promising tenor. David McVicar's production is stunning, a real eye-catcher! I think it's time for the ROH to create a new and wonderful production! with Gheorghiu in it! :) Would absolutely love to see her in Manon Lescaut! Fantastic and for once a complex set added something and was worth the money. And not a vaguely 20th century soldier not knowing how to hold a wooden gun in sight! Absolutely fantastic production all round. Everything was simply outstanding. I go the opera about 20 times a year and this is the best I've seen in years. Saw Adriana last night Angela was perfect in the role BRAVA!! The whole production was memorable. Only down side was the tenor too overpowering in his duets. It was a fantastic night not only the one and only Angela Gheorghiu but also the brilliant young tenor who has a pure and bright voice. I was so happy to see this wonderful production again. I saw this production last night (21 Feb). Having seen Gheorghiu and Kaufmann in 2010, I chose to see Bassenz in the title role and was not disappointed. The entire line-up of principals had a chemistry which brought this performance to life. Combined with the superb scenery and costumes, for me, this is opera at its very best. I could not single out any one singer in particular - Finley, Jagde, Dudnikova and Bassenz all excelled - perhaps because they can also act?? The rare combination of singer/actor was well represented in this performance. I saw the 21 February production also and came away feeling I had been to a really good night! I was particualrly struck by the singing and acting of Hrachuhí Bassénz - what a find for her debut! Her pp and decrescendi above the stave and timing with the conductor were wonderful. But it was also a very strong cast - Gerald Finley really brought Michonnet to life, Princess de Bouillon was not overacted, the Abbé was witty. I thought the sets and lighting worked very well and was intrigued by the replica (?) 18C stage. What a treat! The singing was truly outstanding and the acting and set were equally stunning.So glad I made the effort !! All the superlatives have already been stated, so I will merely say that my wife and I had a wonderful evening and enjoyed the whole experience. I have one tiny criticism and this is only made from a personal perspective, but seated in the front row, seats A26/27, we could see nothing of the ballet because of the positioning of the stage audience. 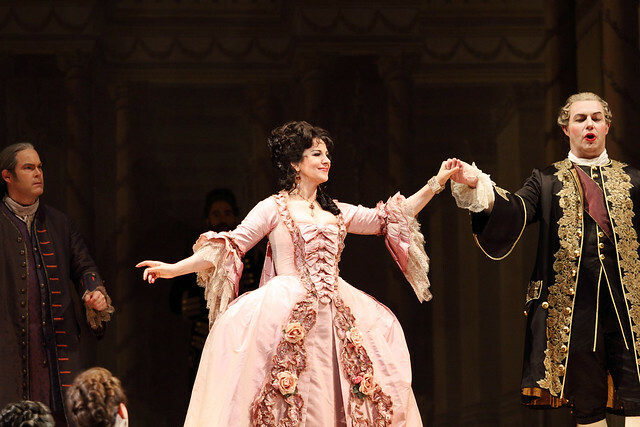 However, congratulations to all concerned especially to Ms Gheorghiu for her brilliance and longevity, and to Brian Jagde who was so impressive in his role and from whom we wish to hear much more. Another plaudit to Ksenia Dudnikova for her contribution and, of course, to the stage management of this difficult tale of theatre life. We saw this on Monday 27th. What an operatic treat, every aspect superlative. This opera deserves a more prominent place in the repertoire. We went on the 27th and thoroughly enjoyed the evening. Everything was right, singers especially, the sets, costumes, conductor and orchestra. Watched the performance on the 24th February, for my husbands 70th birthday. It is the the first time he has seen it and he is an Opera Buff, we thoroughly enjoyed the performance and the music was surperb and wish we could fine an CD of the music. Would certainly watch again.